Join me this Saturday, December 15 at noon Mountain or Monday, December 17, at 3:00pm Mountain for the last 2 sessions of my Super Important Photo Organizing Strategies with Luminar 3 online webinar events!! 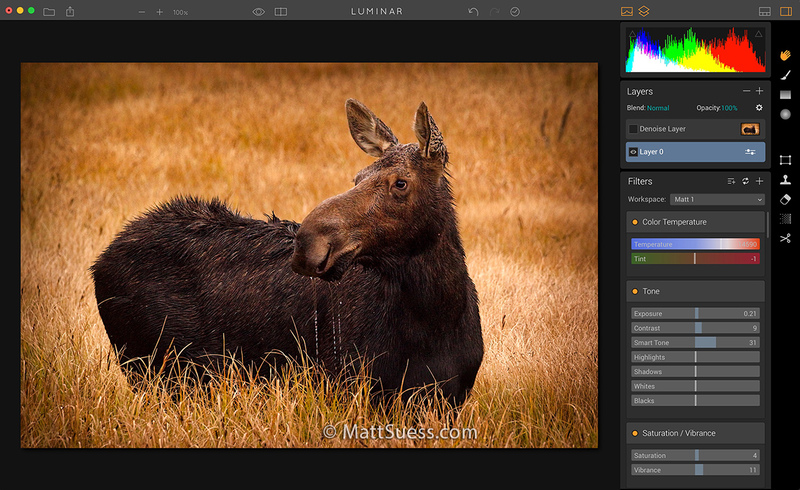 BONUS MATERIAL COVERED: If you work with Image Adjustment Layers, you DO NOT want to miss my super important tips on using them in Luminar 3. You can find out more info and register for the event here. My previous 2 webinars went 20 minutes over the scheduled time so I could get to all of your questions. I’ll do the same for these webinars if needed. Make sure you are ready for Luminar 3 which comes out December 18th!! On December 18, 2018 Skylum will be releasing their long awaited DAM (Digital Asset Manager) for Luminar. Called Luminar 3 with Libraries, this will be a free update for everyone who currently owns Luminar 2018 on Mac and Windows. Originally, it was first talked about being released in 2017. Once that didn’t happen it was next anticipated to be released in early 2018. That didn’t happen either, but now here it finally arrives a couple weeks shy of the end of 2018. Has the long wait been worth it? Let us find out. Join me in one of these webinars to see what is new and to ask any questions you have!! Two New Webinars have been added, for Saturday, December 15, and Monday, December 17. Details and signup are here. Want to join my Newsletter? Sign up here. Since it’s arrival in 2017 Luminar quickly started replacing ON1 as my #1 goto program for enhancing my photographs. At the time, I was still using Capture One Pro and, to a much lesser extent, Lightroom for my RAW files. After some initial adjustments to my RAW file I would send a 16-bit Tiff file to Luminar to finish it off and give it my signature look. Skylum’s Luminar 2018 received an update for Windows today, bringing the current version to v1.1.0 (1235). In this video I will show you all the new improvements. Be sure to download my free Luminar presets & workspaces. 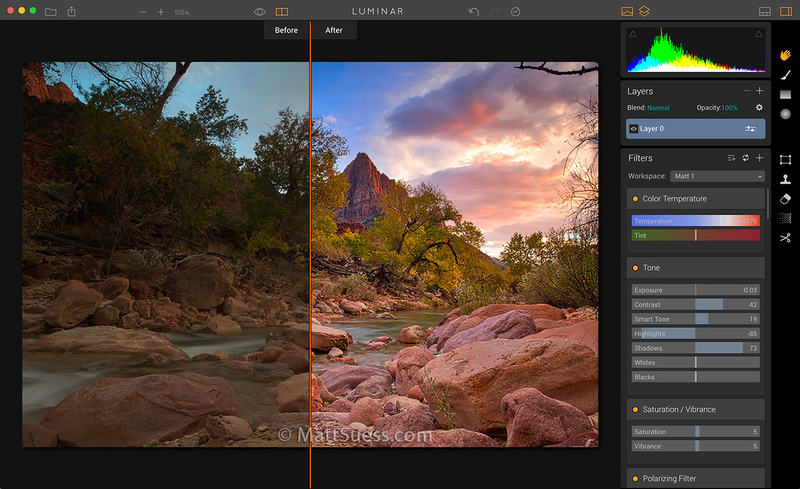 Save 10% on Luminar with coupon code mattsuess. Save Native files. Be sure to save your editing projects in the new native Luminar format. This makes it easy to come back and edit later. Plus files can be shared between Mac and Windows users. More export control. 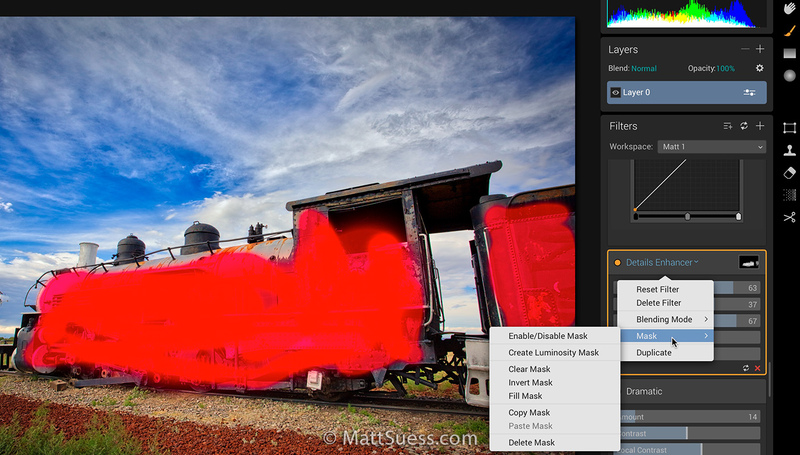 You can choose to export to the Adobe RGB wide color profile or the ProPhoto space on export. You can also sharpen an exported file which is great for printing. 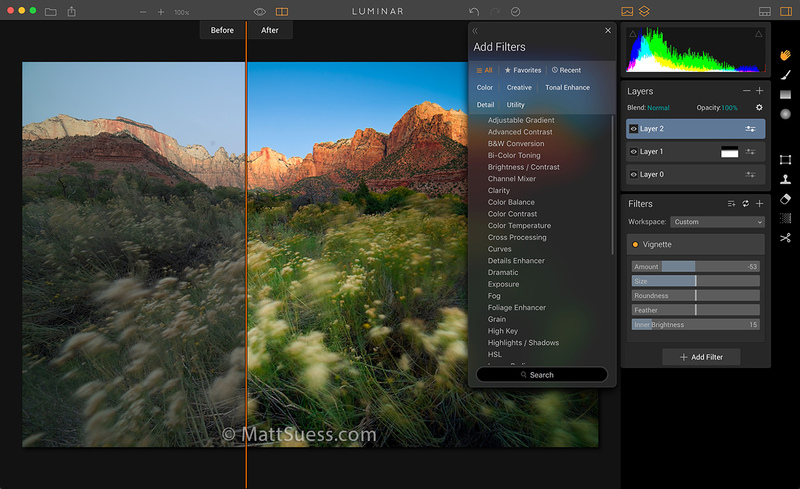 Macphun today launches Luminar, it’s newest photo editing software for the Mac. It is their first all-in-one editor and includes some key features such as a RAW converter & processor, non-destructive workflow, customizable workspaces, layers, 38 filters, and much more. I have been using a beta of Luminar for a few weeks and have been very impressed. Be sure to read my Luminar Preview here! Image quality has been fantastic and I have really been enjoying the workflow and tools available. But don’t just take my word for it – there is a FREE TRIAL available so you can see first-hand how impressive the program is and be sure to let me know how you like it, what your favorite features are, and even let me know what is missing from this v1.0 software in the comments below! Be sure to join my Luminar and Aurora HDR Users Group on Facebook! UPDATE: Now you can download a FREE TRIAL of Luminar! Macphun, the (currently) Mac-only photo software company that is behind popular photography editing programs Aurora HDR 2017 and the Creative Kit (which features programs such as Intensify, Tonality, Snapheal, FX Photo Studio, Focus, and Noiseless) has a brand new program coming out November 17, 2016 called Luminar. I have been working with a beta version for a couple weeks now and here is a quick preview with my initial impressions. Also included in this preview is my exclusive video interview with Kevin La Rue, the V.P of Macphun regarding Luminar. Look for the interview towards the end of this preview! Luminar is a brand new program and is Macphun’s first all-in-one photo editing solution. The Luminar user interface is built around the idea that every photographer is different, and therefore their photo editing needs are different too. Users can choose from 4 default interface variations, designed for: quick image fixes, photo enhancement with presets, an intermediate level of control, and advanced editing. Luminar so far in my testing has done a very impressive job in RAW processing from my Sony a7R files. Shadow recovery is way better than Lightroom and on par with Capture One Pro, with fantastic color and low noise. Luminar is the first Macphun editor to introduce Workspaces – innovative collections of tools most suitable for a specific type of photography. Default Workspaces will cover Portrait, Landscape, Street, and Black & White Photography. In addition, users can create an unlimited number of custom Workspaces, as well as import Workspaces from other photographers. Luminar 1.0 will feature over 35 innovative imaging filters, from classic Tone & Exposure, to Bi-Color, Photo Filter Emulation, Cross-Processing, Detail Enhancement and dozens of others. Each filter category includes a set of precise controls, which can be adjusted to create countless different looks. Convenient descriptions and previews of the effect are available with each filter too. 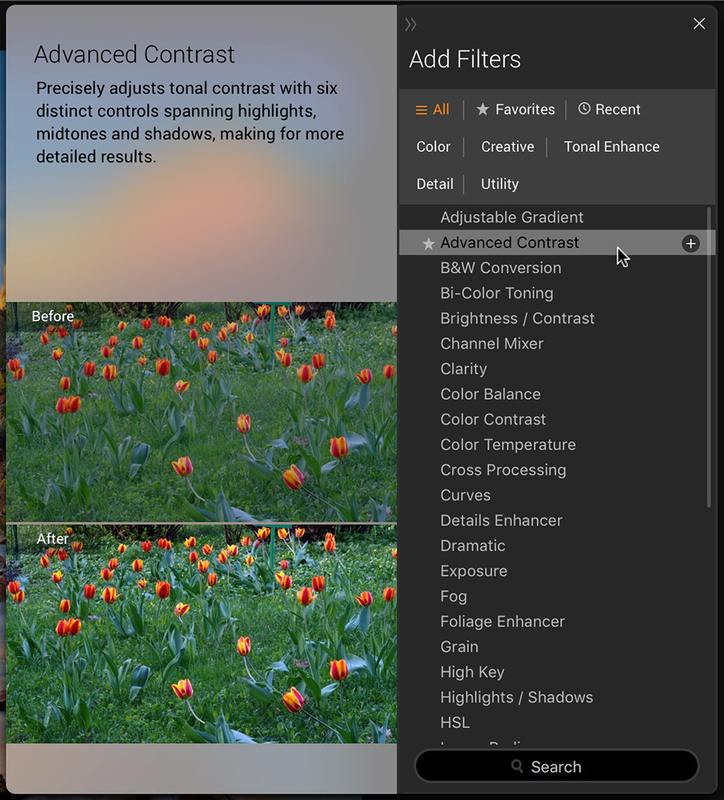 Some of my favorite right away are the Adjustable Gradient, Advanced Contrast, Image Radiance, Channel Mixer, Color Contrast, and Orton Effect filters. Users can save a group of pre-adjusted filters to create their own one-click preset, or for convenience, choose from over 50 pre-defined presets. With categories ranging from Outdoor to Portrait, Street to Drama, there’s a preset for every photography style. The new Luminar for Mac introduces a new editing workflow. Users can change the order of applied filters at any time in the editing process, therefore totally changing the look of their photo. With the new History feature users can check all steps of the editing process, and go back to any step at any time. The new selection tools in Luminar include: adjustable editing brush, radial and gradient masking, as well as masking with a single layer and masking with an independent filter. Together with the powerful blend modes, layers and filters, these masking tools allow users to easily perform even the most complex edits. One thing I really like about Luminar is the ability to create a mask on any individual filter. This allows you to paint-in the effect you want to the specific part of the photo you want. No need to create a separate layer – just grab the brush tool and click on the filter you want to create the mask from and paint away. What else is in Luminar? Essential photo fixing tools, including spot healing, crop & transform, clone & stamp, noise reduction and other. Complete photo enhancement toolset, including exposure & contrast controls, saturation, vibrance, clarity, sharpness, polarization, and more. Creative color controls & adjustments, including bi-color, split toning, selective luminosity, saturation & hue controls and more. A myriad of photo filters, including cross process, glow, orton effect, monochrome, soft tone and more. As the version of Luminar I have been using for the last few weeks is a beta I will withhold giving a more in-depth review until I am able to test a final shipping version. So I won’t go into detail on missing features, as I already sent Macphun my list of things missing and will wait to see what gets added between now and the final shipping version. In certain situations I noticed some undesirable results in image processing that I made them aware of – which is normal in beta testing – so I won’t give an official grade on image quality either at this point. I will say however, in regards to image quality, I am for the most part quite impressed with the results from RAW files from my Sony a7R. Results that in many cases equal, if not exceed, what I have come to expect with Capture One Pro and which are far better than what I see in Lightroom – especially in shadow detail. Having a completely customizable workspace is wonderful, and there is a large amount of filter effects you can use to completely enhance your photographs. Luminar is not here to replace the Creative Kit nor Aurora HDR 2017. While some features overlap with the Creative Kit, some still remain exclusive to the Kit while others are exclusive to Luminar. Watch my video interview with Kevin La Rue, the V.P. of Macphun below for more info on this. Luminar is available for pre-order now at a discounted price of $59 for all new users, and just $49 for anyone who already uses has Macphun photo software. The pre-order offer also includes a bonus pack of photo training videos and a course on building a photography business from Will Burrard-Lucas, an award-winning UK based wildlife photographer with over one million Facebook fans. Laminar will be available to download on November 17. 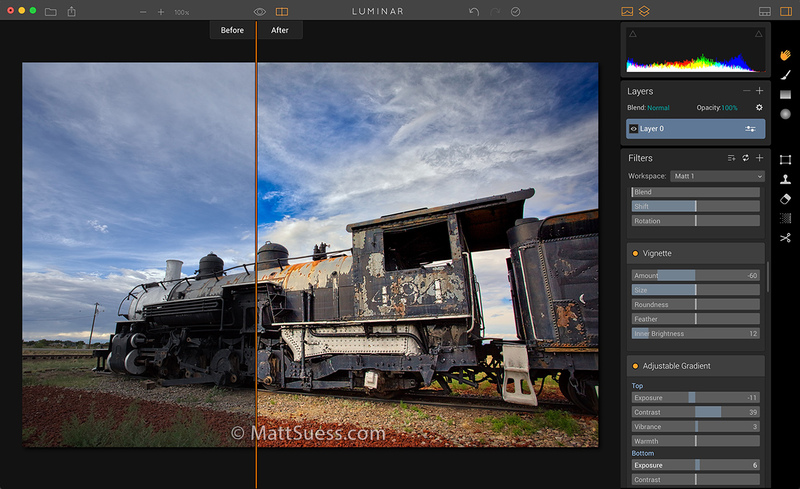 Read more about Luminar on Macphun’s blog here and pre-order it here. The last week of October I had the opportunity to interview my friend Kevin La Rue, the V.P. of Macphun. This interview was primarily for those who purchased my Mastering Aurora HDR 2017 Online Course, as we talked quite a bit about Aurora and Macphun. But we also talked about Luminar. The video below contains the edited par of the video where we discussed Luminar.